Whether we like it or not, we artists are judged, not by one painting, but by our entire body of work. If we look throughout history of art, notable paintings of each artist have a special definitive style. It is as if one can paint brilliantly in any genre or theme, but will not get any credibility for one's work unless one has a clear way of executing the art. Painting is not unlike music. Although, I think that the rules for painters is far more rigid. For example Eric Clapton, will not be recognized for his latest hip-hop album (not like he'd likely make any)... It would be just downright strange! So here I am, stuck to a way of painting like I have done for the last couple of years. 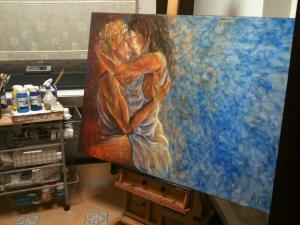 Sometimes I long to do something different... paint like Van Gogh, or Klimt or do some crazy abstract. I do that in private, and do not exhibit them nowadays. It will just not look right. I do get most good reviews and sales from painting the figures like I do today. I love them, and I am glad many do too. It also comes easy to me because of practice. I guess being stuck to a style is not a bad thing after all. Austria is very proud of it's famous artists. One of which is Egon Schiele (1890-1918). Schiele's art still fascinates many today. His painting of the human figures are true to their spiritual self, rather than photo realistic. This is what I really love about the Expressionists. Their skill in communicating through lines and color transcends their message through time, and outlives any imaging technological advances today. In my website is a tribute to this artist, Egon Schiele who, sadly, died too young... at only 28. One cannot help but to realized the loss to the art world of the many masterpieces he would have created had he a full life span. Still away in Europe accompanying my husband with work. 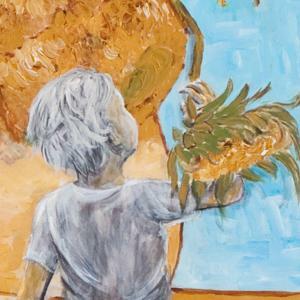 In circumstances like these, when I'm not able to paint, I find time to work on my website. There is not much to upload (since I am not painting), but I do make time to write some articles for the young readers who like to understand appreciation of art. In the process of writing, I discover and learn a lot about art myself. Writing about the great masters and their famous paintings make me feel somewhat small about what I do art-wise. 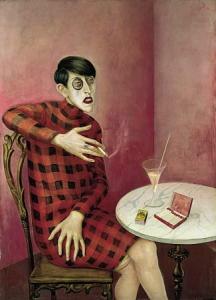 The depth in a painting like Otto Dix's Portrait of writer, Sylvia von Harden, is so amazing and says so much. Perhaps it is in continued learning and discovery that we grow as artist. In this modern world, it is a lot more challenging... but by far more rewarding. Today I worked in the Garden. I was not doing any gardening, though. Now I finished these two pieces, and my eyes are all red. It is still pollen season up on this mountain some 1300m above sea level. 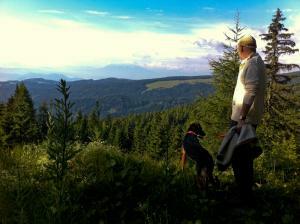 This is my in-law's house in Austria, and a nice day it was to be outdoors, and getting work done. I spend quite a bit of time in Austria. Living in Singapore, it is a 12hour flight + 5hrs of driving to get to my in-law's house in the mountain. Austria is about the most naturally beautiful country in the world. It is also very clean and is home to many artists. No wonder. This land just inspires art. Here is where I first picked up the brush in 2005. This is the first stage. I render the figures in black and white before adding the colour. This method of painting is called �grisaille� method. Refer to my earlier article : Grisaille Painting To Create Realism and Drama . I find this the least fun part of the work cos it requires a bit of accuracy and the paintings are quite tight. Human figures are painted bald and clothe-less during this stage. That is how I can achieve a 3 dimensional effect, and also allows the hair and clothes to render more realistic. Keep connected with my blog for updates on new work and articles. I try to make the content interesting as with the art. Art, to me, is more a form of escapism than a reflection of reality. Hence my main focus while creating is to achieve "feel", "aura" more than "emotion". I believe that "emotion" comes from inside-out. I hope my art impacts you outside-in.